Here’s one of my recently completed projects – a patio garden make-over after a kitchen and family room renovation. 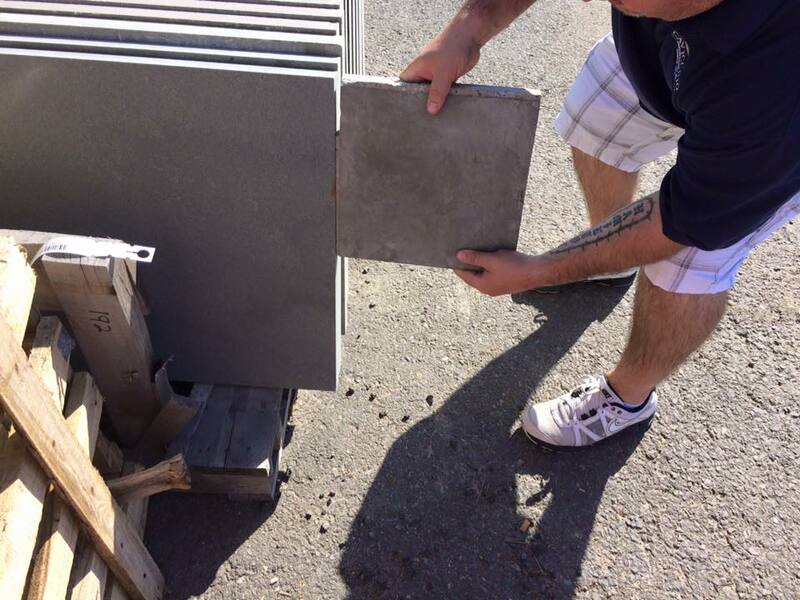 I love it when existing clients call me when they are doing a renovation. I already know their garden style, family lifestyle, how they use and enjoy their landscape, color palette, and the land’s orientation to sun and shadow. (Of course, with new clients, I gather this information so I can create a custom and wonderful garden design for them.) In this case, a recent kitchen renovation and family room upgrade included a new exit with lovely French doors and brick steps that were…leading to nowhere. It made their existing patio and garden off the living room seem far away and not part of the view or their daily life. The design project included a new path to the existing dining patio from the new doorway, enlarging the existing patio so that a fire pit and chairs or another table could be added and, of course, plantings to make it all one and as if it had always been that size and shape. And of course, unexpected things pop up on site that need to be dealt with during construction. Before of the utility area just beyond the new door and steps. Previous to this new patio extension I had tweaked some existing straight narrow planting beds on the outside of the brick patio wall to echo the lovely curve of the brick wall by changing the shape and expanding the plantings within it. Now I wanted to extend the existing curves and continue the feeling of the beds, and also work with the two exisiting dogwood trees. Design challenges included hiding the view of the bulk head (access doors to the basement), meters, AC, and generator and blending the new patio with the existing paved area so that the transition was seamless and as if it had always been that way. At a design review meeting, the homeowners fortunately decided to move the bulkhead to the side creating a larger planting area with no bulkhead view. 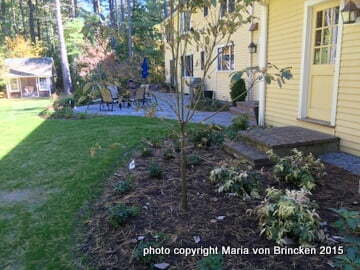 That decision enabled me to create a lovely new shade garden to balance all the hardscape. 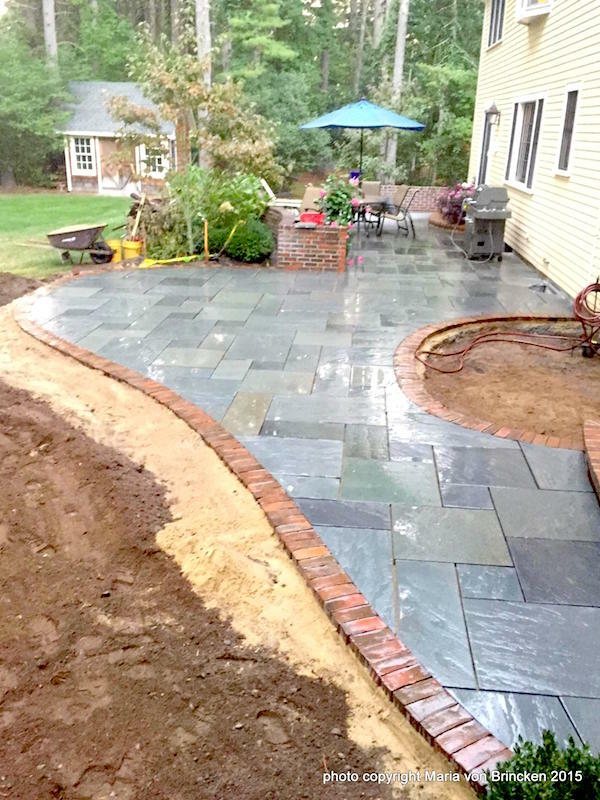 Construction challenges included matching a tri-color pattern of blue-stone pavers installed over a decade before in the existing small patio area. The first two colors were an easy match, but the third proved challenging. So I got into the act. With a sample in hand, I searched every crate at the stone yard until I found one small crate hiding in a corner. It was an ‘all color thermal’ that had the greenish tinge we were seeking. The other two colors were blue cleft and a purple version of the cleft. The use of the thermal in the original pattern was a interesting twist, but nice. Triumph! I matched the third color! 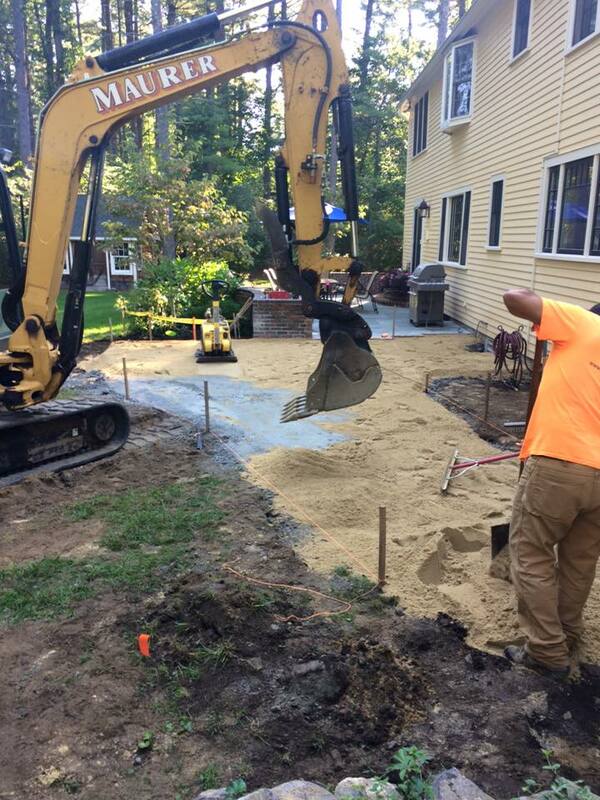 It’s very common to unearth hidden problems when you start excavating and that’s where a a landscape designer can jump in and quickly sort out any problems while making sure the design is not compromised. During the demolition an old drainage pipe was discovered. It was originally installed at much too shallow a depth. And then we found the other drainage pipes from 3 downspouts clogged. 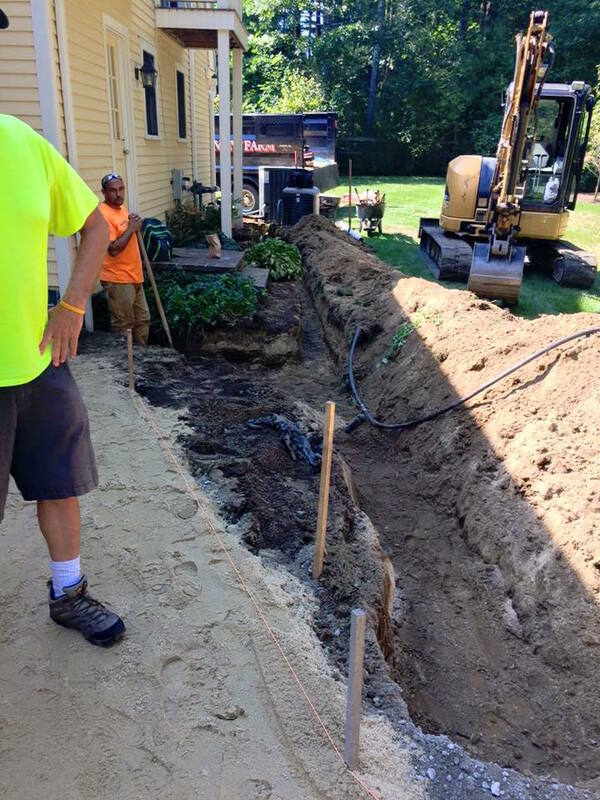 The decision was made to connect all three and install a new pipe deeper and reroute it so that it did not run under the new patio addition. Also I wanted to make it sure it wouldn’t affect any future possible swimming pool plans so I determined a new direction as well. The pitch worked in our favor and we were able to daylight the pipe into a good spot in the homeowners’ woods (with a covered end, of course, to keep the critters out). In this photo you can see my yellow tape. The new edging and paving is laid and I’m measuring the area so I can mark the new planting bed edge for the crew. 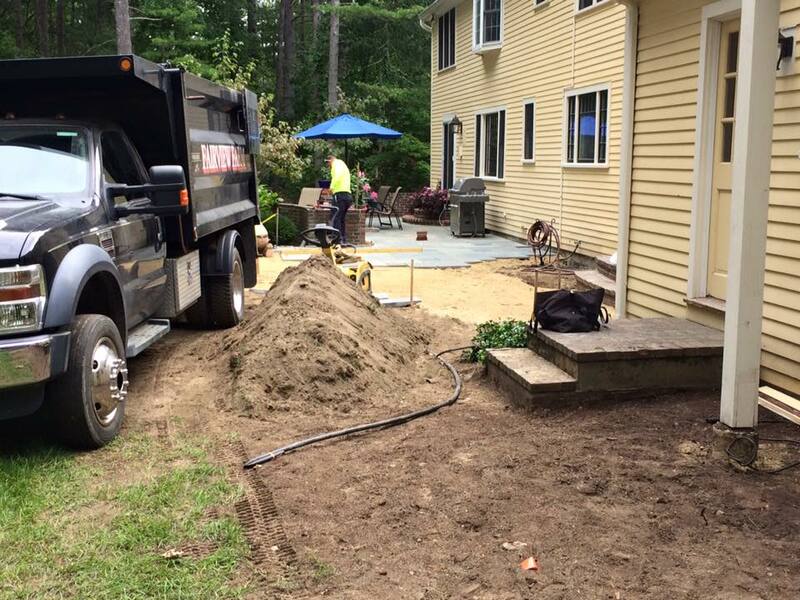 They will remove the sand, add composted soil, and mound the bed to blend into the lower existing lawn grade. You can see the existing patio wall and the edge of the existing garden that includes a dogwood tree. 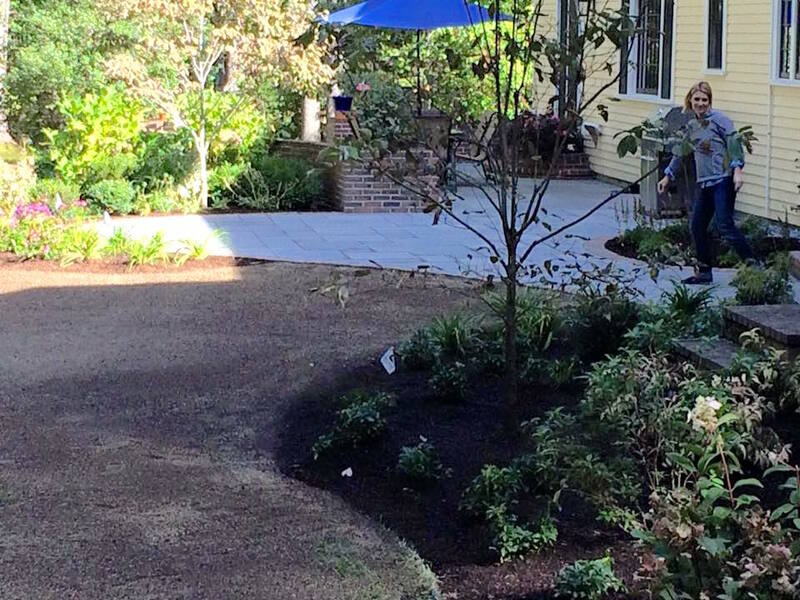 The new planting beds echo and extend the shape of the existing patio. 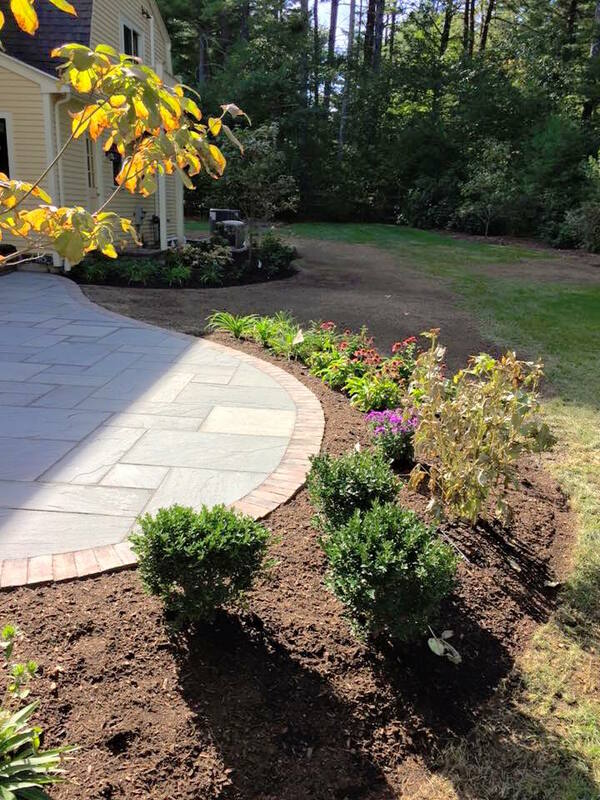 They are also designed for four season appeal with boxwood that repeats the patio bed planting and perennials for spring, summer, and fall color. The perennials also repeat those used in the front entry gardens. Another feature is the brick edging outlining the patio and walkway. The existing patio has a curving brick wall defining the edge of the dining patio. The brick continues the texture and color of the brick wall into the flat plane. Luckily the homeowner had extra brick so it was an exact match. Using the brick creates a cohesive continuation of old blending into new. Looking back along the new patio from the new steps to the old patio section outside the living room. A few weeks on and the lawn has germinated, the new containers have arrived, and we are just waiting for the fire-pit area chairs. For now, the homeowners will use their patio table chairs for the new fire-pit. The dogwood tree in the foreground was transplanted from the woodland edge to this new garden bed around the old back door. As it was planted at the same time as the existing garden tree, it’s the same size and age as the two flanking the existing patio and garden. This tree will add an important vertical aspect to create an intimate space. Its placement, size, and repetition helps to connect old and new. The homeowners have already enjoyed toasting marshmallows for s’mores with their new fire-pit. We explored gas, but felt the portable fire-pit gave them more options to use the space. If they have a large party, the fire-pit can be located on the grass. A second dining table and chairs can be placed in the patio extension. 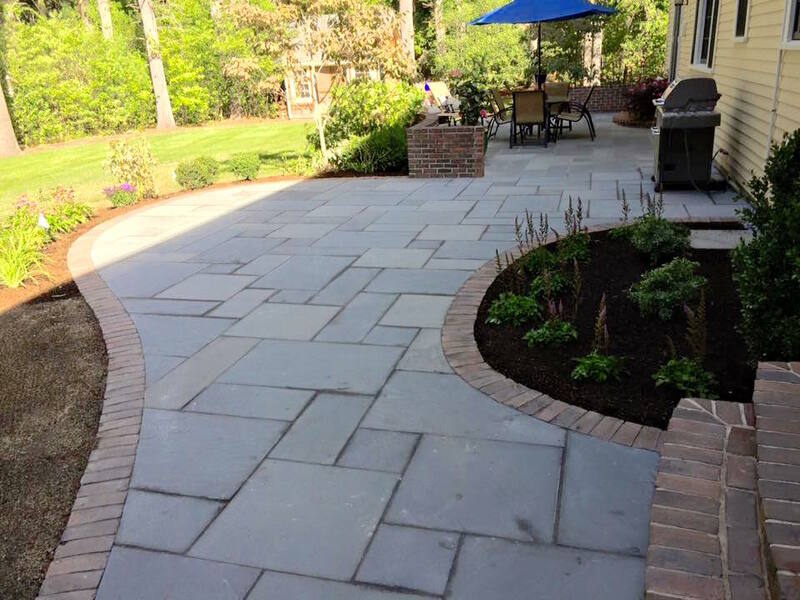 The design and installation of this patio project is a good example of the positive role a designer can play in planning and supervising even a small garden renovation project.